The David S. Ishii Foundation is a non-profit corporation whose primary mission is to promote and advance the game of golf, and to educate the public as to its benefits to society. The primary goal of the David S. Ishii Foundation is to fund the annual Hawaii High School Athletic Association (HHSAA) State Golf Championships for Boys and Girls. The foundation also provides college scholarships and financial aid for junior golfers pursuing golfing excellence. 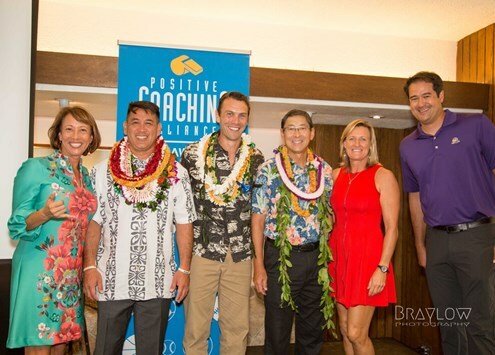 David was named Positive Coaching Alliance-Hawaii Coach of the Year at its annual awards breakfast in May. He was honored for his work over the years as golfer, coach and humanitarian. Pictured below are Jeaney Garcia (PCA-Hawaii Executive Director), 2017 honorees Greg Lum Ho, Kyle Smith and David, and emcees — and Olympians — Shelley Oates-Wilding and Kevin Wong. To see PCA-Hawaii's letter to David click here.